NUTRIOSE® products are dextrins made from wheat or corn starch that contain more indigestible links than traditional starches or maltodextrins. NUTRIOSE® soluble fiber has a high-digestive tolerance, a low-glycemic and insulinemic index, a low-caloric value (2 Kcal/g), is non-cariogenic, highly stable in food processing (i.e. acid and heat-resistant, highly soluble, low hygroscopicity) and easy to use. NUTRIOSE® is directly compressible. 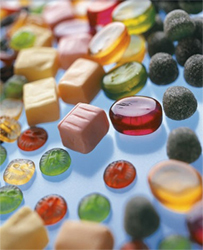 NUTRIOSE® soluble fiber can be used in confections and nutrition bars.